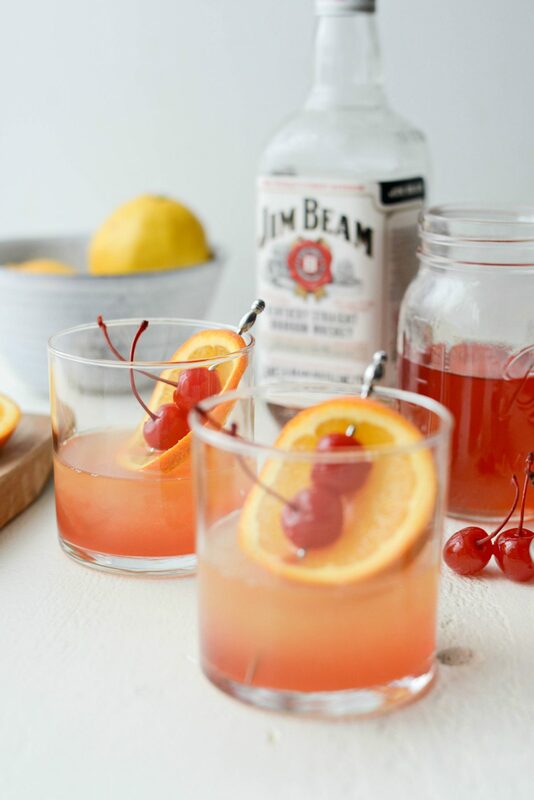 Cheers to spring with a Whiskey Sour Sunrise! 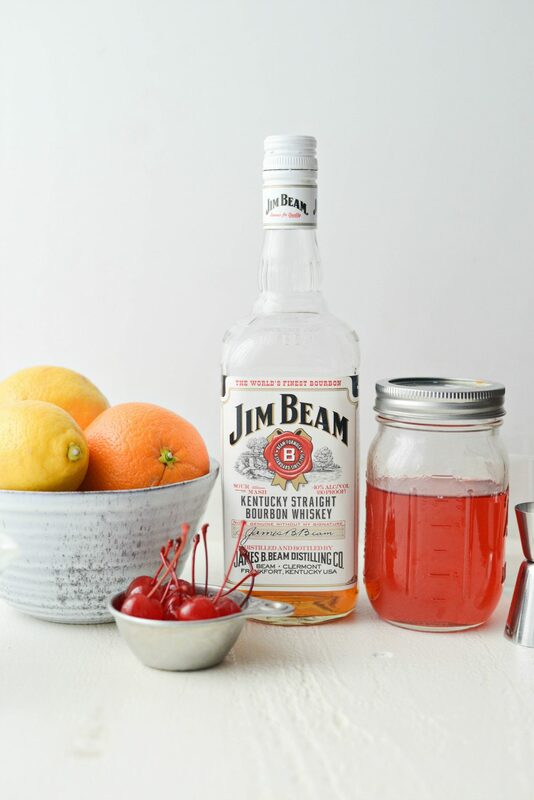 Whiskey, freshly squeeze lemon juice and homemade cherry simple syrup makes for one excellent adult beverage! Yields 2 drinks in minutes. GAH! An alcoholic drink on simply scratch. Well, not the first if you count this baileys milkshake. But lets get real. It’s basically the first one since 2017. With that said, I’ll let you in on a little secret. Over the last year or so, I’ve really looked into making cocktails. Classics and originals, the whole idea mixing and concocting alcoholic drinks fascinates me. In the past my typical go to was a glass of malbec, margarita or rum and coke, but I wanted to broaden my horizons and order something fun every once in a while and know what it is I’m actually ordering. 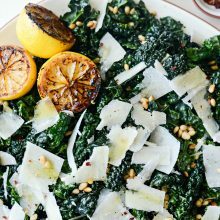 So I started researching classic recipes and mastering them at home, like this one I’m sharing today. 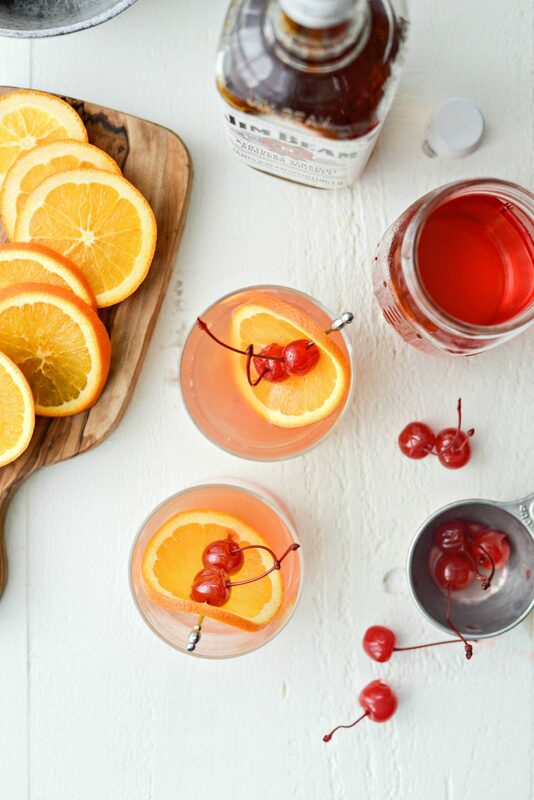 It starts with a whiskey sour and then morphed into this whiskey sour sunrise drink after I used the cherry syrup from this recipe. So what is a whiskey sour sunrise? 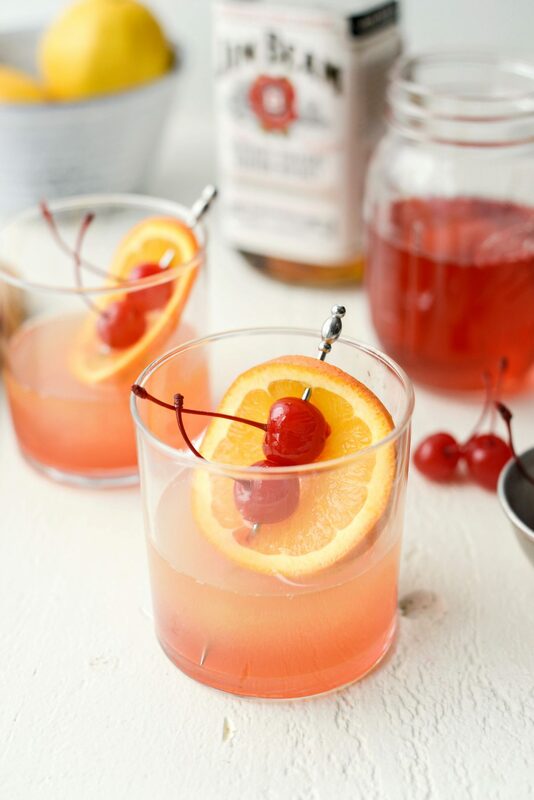 It’s a classic whiskey sour but instead of a plain simple syrup I sweeten this drink with a homemade cherry simple syrup. Here is what you will need; whiskey, freshly squeezed lemon juice and a simple syrup. A simple syrup consists of equal parts sugar and water. For example, 1 cup water and 1 cup sugar is usually the go-to ratio. 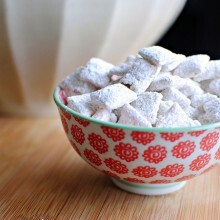 You add both of those to a saucepan and heat (not boil), stirring until the sugar dissolves. 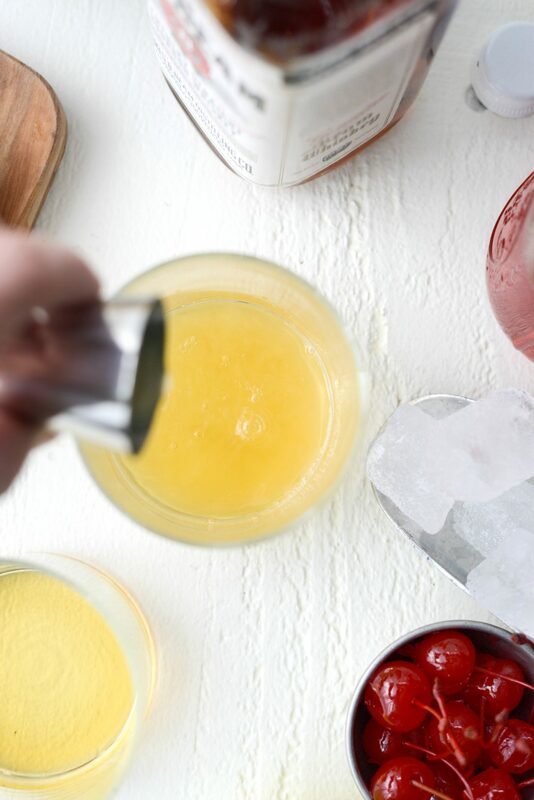 For this recipe, I used the juices caught from straining thawing cherries. Then I added those juice with enough water to equal a cup and mixed it with a cup of sugar, heating until the sugar disappeared. Cool completely and chill until ready to use. 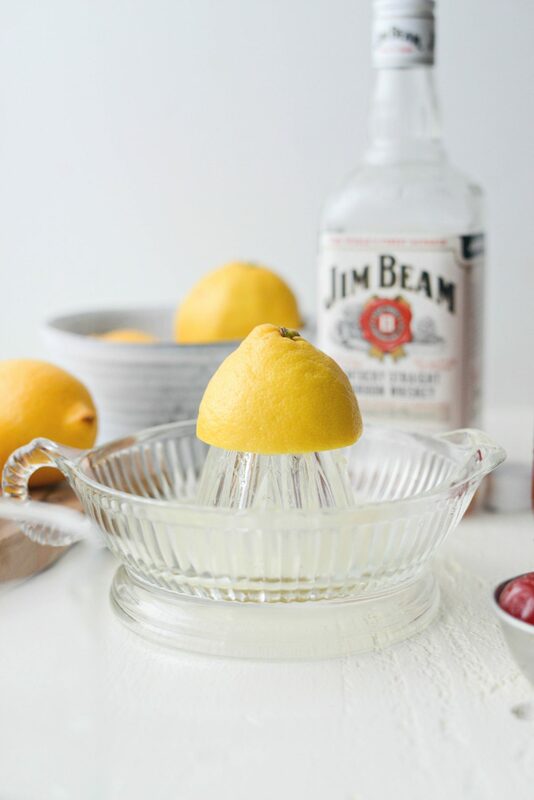 To start mixing the drink, squeeze a couple lemons until you get 1/4 cup of juice, which is about 2 lemons. 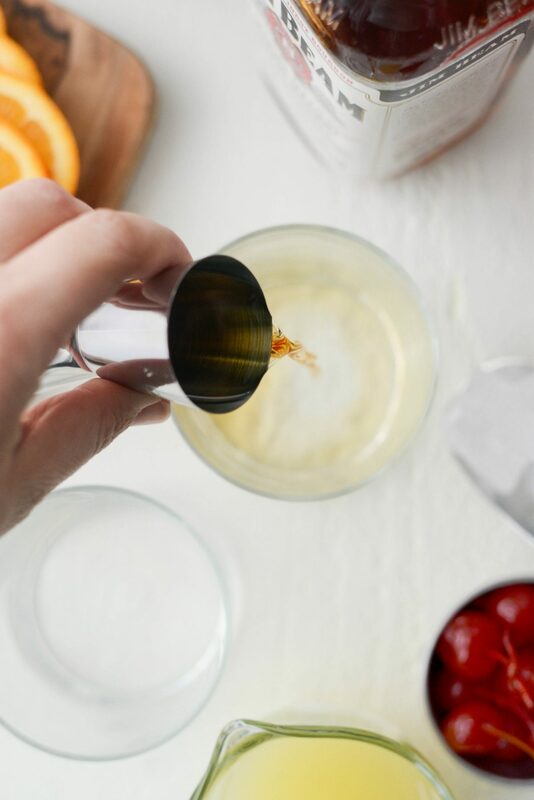 Pour the freshly squeeze lemon juice through a mesh strainer into a liquid measuring cup. 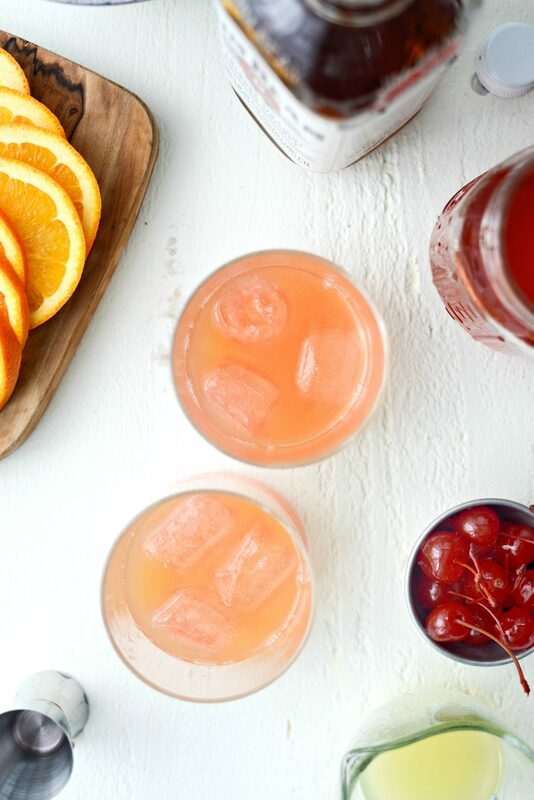 You don’t want seeds or pulp in your cocktail. Next, measure and pour 3o milliliters (about 2 tablespoons) of whiskey into each glass. Then measure and pour the same exact amount of freshly squeeze lemon juice. 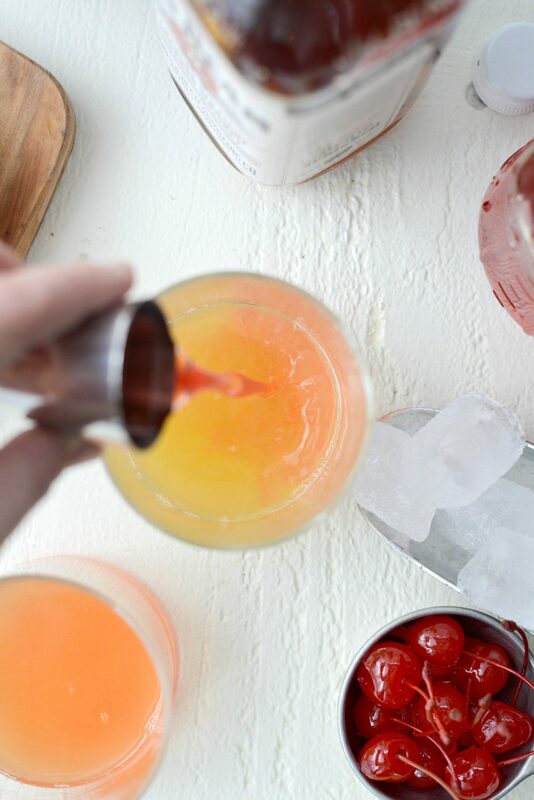 Lastly, pour in 1-1/2 tablespoons cherry simple syrup (from this recipe/post) and lastly, drop in a few ice cubes. Finally garnish with an orange slice speared with a couple maraschino cherries. 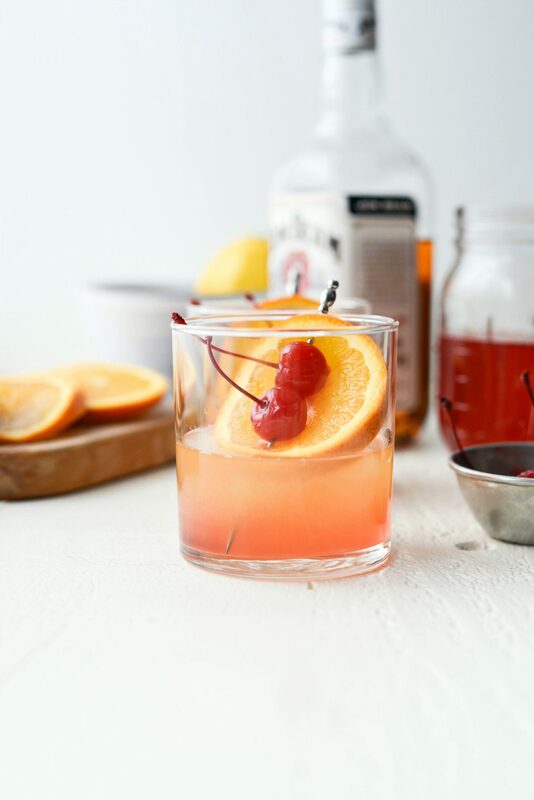 This whiskey sour sunrise is a sipping drink. 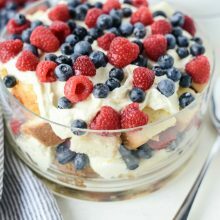 It’s sweet, fruity and delicious while packing a punch. 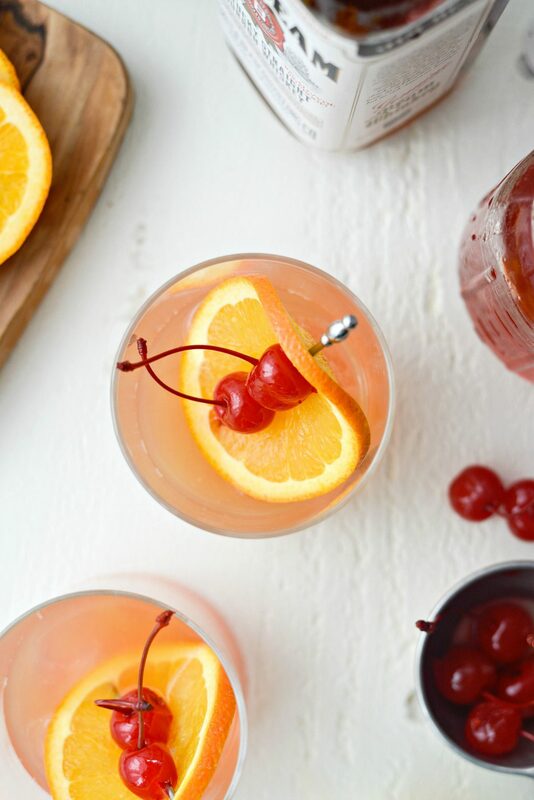 Enjoy this springy cocktail and as always, drink responsibly! Enjoy! 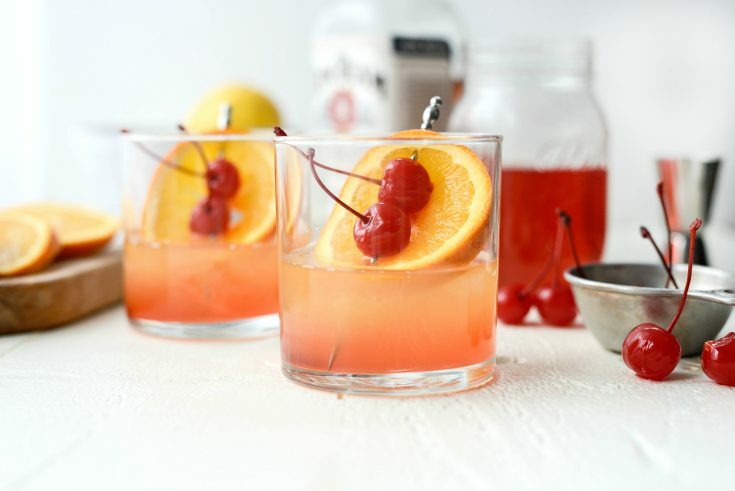 And if you give this Whiskey Sour Sunrise recipe a try, let me know! Snap a photo and tag me on twitter or instagram! Divide the whiskey, lemon juice and simple syrup among two glasses. 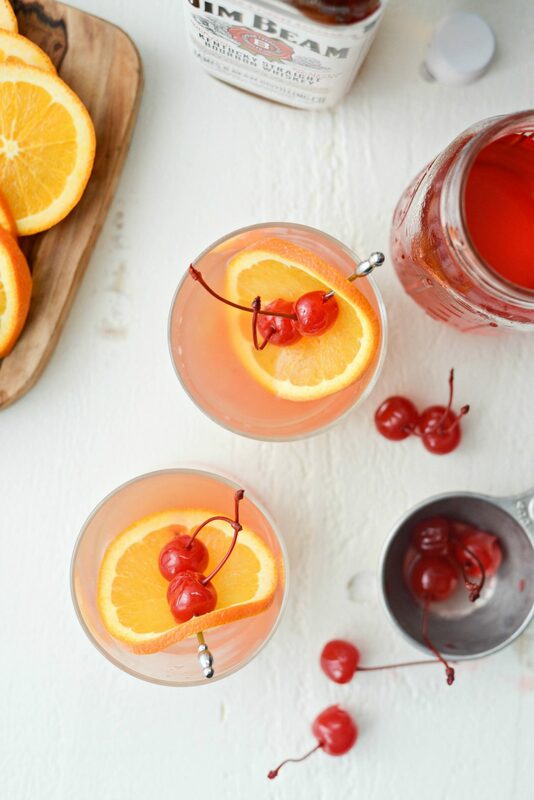 Garnish with an orange slice and maraschino cherries. 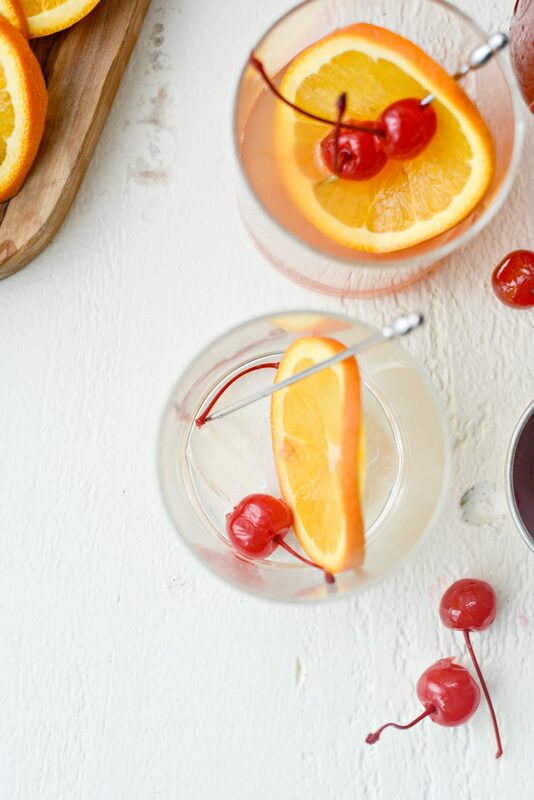 garnish with orange slices and maraschino cherries.